(LEBANON, IL.) 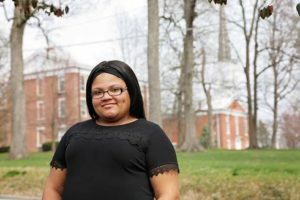 — McKendree University senior Naeelah Chism has been awarded a Fulbright U.S. Student Program Grant to be an English teaching assistant in Kuala Lumpur, Malaysia for 10 months. The highly competitive Fulbright program is the U.S. government’s flagship international educational exchange initiative. Each year, more than 1,900 U.S. students, artists and young professionals are offered grants to study, teach English or conduct research in more than 160 countries. Students are chosen for the Fulbright based on their academic merit and leadership qualities. Chism, of Fairview Heights, Ill., will graduate from McKendree University in May with a bachelor’s degree in political science and minors in gender and legal studies. She is a 2019 recipient of the university’s Dr. Martin Luther King Humanitarian Award, which recognizes compassion, understanding, tolerance and participation in service programs. She volunteers at the Christian Activity Center, is an assistant resident director, a leader in the United Feminists group and active in the “It’s on Us” week on campus. In 2018, she went to Washington, D.C., to advocate for sexual health education and women’s rights. Upon her return to the U.S., she plans to pursue a master’s degree in educational leadership and policy. The Fulbright Program is the world’s largest and most diverse international educational exchange program, designed to increase mutual understanding between the people of the U.S. and other countries. Since its inception in 1946, it has provided more than 380,000 students, scholars, teachers, artists and other professionals with the opportunity to exchange ideas and contribute to finding solutions to shared international concerns. Fulbright alumni include 59 Nobel Laureates, 82 Pulitzer Prize winners, 72 MacArthur Fellows, 16 Presidential Medal of Freedom recipients, and thousands of leaders across the private, public and non-profit sectors. The program is federally funded and overseen by the Bureau of Educational and Cultural Affairs. Participating governments and host institutions, corporations and foundations in more than 160 countries and the U.S. also provide direct and indirect support.